FREE and OPEN to the public. 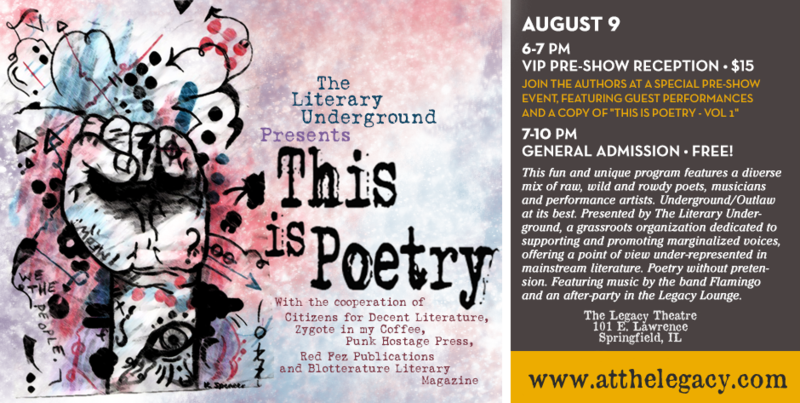 The Literary Underground is pleased to present “This is Poetry” sponsored by Citizens for Decent Literature Press, Punk Hostage Press, Red Fez Publications, Zygote in my Coffee and Blotterature Literary Magazine. AUGUST 9th 7-10PM. The Legacy Theatre, 101 E. Lawrence Ave., Springfield, IL. FEATURED PERFORMERS: Ron Whitehead, Ryder Collins, Craig Cady, Bill Gainer, A. Razor, T. A. Noonan, Carleen Tibbetts, Russell Jaffe, Ryan Snellman, Michele McDannold and Brian W. Fugett. AND music by the band FLAMINGO. Suitable for ages 18+. Cash bar 21+. After-party in the LEGACY LOUNGE to follow performances. Accessibility to the pre-show reception is limited for the physically challenged. Please call the theatre at 217-528-9760 to discuss your unique needs. The Legacy serves traditional movie refreshments, beer & wine.